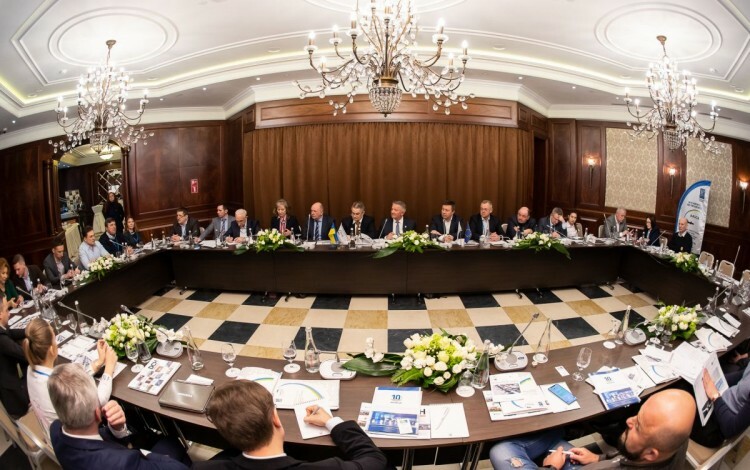 Ukrainian airport directors and air travel industry officials gathered in Kharkiv on 28 March to address the future development of the sector at an extraordinary meeting of the Airports of Ukraine Association. The event, hosted at Kharkiv International Airport owner Oleksandr Yaroslavsky’s five-star Kharkiv Palace hotel, featured debate on the legal framework of the country’s air transport industry along with the regulation of fees, land use issues, and the harmonization of standards within the industry with EU norms. Guests included Airport Association officials, representatives of the Infrastructure Ministry, members of the Ukrauorukh state enterprise management, and airport officials from Kyiv, Odesa, Dnipro, Zaporizhia, Vinnytsia, Kryviy Rih, Poltava, and Kherson. State Aviation Administration first deputy head Serhiy Korshuk commented on the benefits of building bridges between the public and private sectors. “This event is particularly useful in bringing together members of the business community with officials and creating a platform for open discussion.” This positive appraisal was echoed by Airport Association Chairman Petro Lipovenko. Kharkiv International Airport was completely overhauled as part of the eastern Ukrainian city’s preparations for the Euro 2012 football championship. The redevelopment project was managed on a public-private partnership basis, with Yaroslavsky allocating USD 107 million for the construction of a new terminal building and reconstruction of existing facilities. Yaroslavsky’s overall investment in the city’s Euro 2012 preparations exceeded USD 300 million, while his total investments in the Kharkiv region total around USD one billion. Kharkiv airport has been among the leaders in recent years as the Ukrainian aviation industry has experienced unprecedented growth. The airport was used by around one million passengers in 2018 and launched 12 new regular flight services. Airport management aim to boost passenger numbers by 25% during the present year. Yaroslavsky has stated his readiness to invest USD 70 million in the construction of a new terminal complex for the city of Dnipro. At the request of the Dnipro Mayor, he recently financed a survey by leading European air travel industry experts from Airport Consulting Vienna. This research concluded that it would be more cost effective (USD 200 million rather than USD 400 million) and efficient (two years instead of five years) to develop the existing Dnipro International Airport facilities rather than develop an entirely new site.